The daily catch of delicious seafood in the Gulf of Thailand includes plenty of sardines--the plentiful small fish that's the key ingredient in making world-famous Thai fish sauce. We love these sardines for the great flavor, health benefits. The low price which makes them a "poor man's gourmet", as they can make instant noodles come alive with great flavor and nutrition (see our recipe for Mama noodles with sardines). These are easy-open cans, each can has 3 whole fish which are ready to eat (may vary slightly in size). 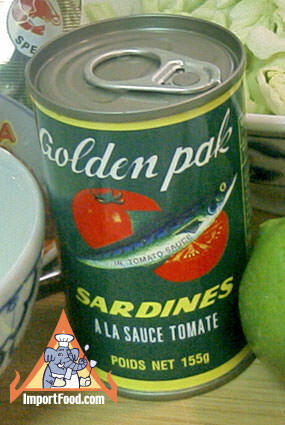 Ingredients: sardines, water, tomato sauce, salt. Product of Thailand.